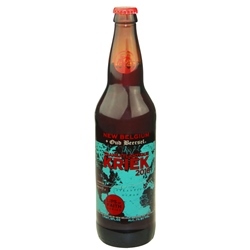 Released annually since 2003, Transatlantique Kriek (ABV 7%) begins its life in oaken vessels at Gert Christiaens' Oud Beersel, a 130-year-old lambic brewery in the Zenne valley of Belgium – home of authentic Lambic beer. 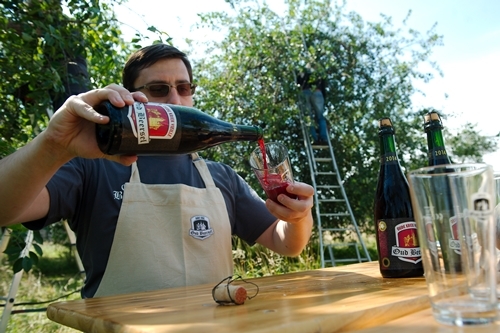 After time spent aging in wood, Oud Beersel's lambic is blended with tart Polish cherries; this resulting cherry lambic, or Kriek is shipped across the Atlantic to New Belgium, where it is blended with an equal portion of golden sour ale matured for 1 – 3 years in oak vessels called foeders. 50% Sour Golden Ale blended with 50% Traditional Cherry Lambic Ale leads to an intense cherry nose, a sour flash across the palate and a refreshing finish. Pouring a clear ruby red with fluffy cotton candy pink foam, it offers aromas of cherry pie filling and pastry, almonds and vanilla, berry jam, raspberries, hibiscus, and green apple. Medium-bodied, spritzy, and mouth-watering, with fruity sweetness quickly joined by light bright tartness. 22 oz bottle. 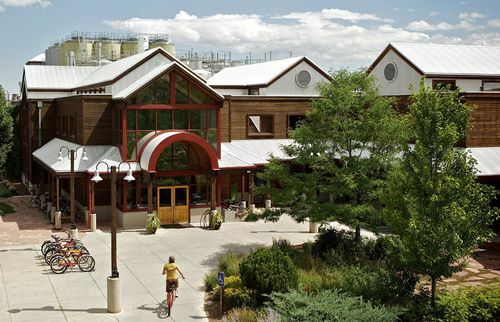 New Belgium Brewing Company is a craft brewery located in Fort Collins, Colorado. 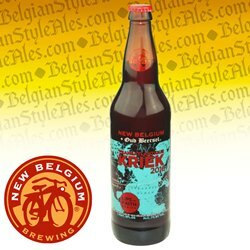 Inspired by a bike trip through European villages famous for beer, it was opened in 1991 by Jeff Lebesch and Kim Jordan. As of 2016, it was the fourth-largest craft brewery and eighth-largest overall brewery in the United States. The company emphasizes eco-friendly practices and is 100% employee-owned. Oud Beersel Brewery, located near Brussels in the town of Beersel, is one of the last remaining authentic lambic breweries in Belgium. Founded in 1882 by Henri Vandervelden, the small brewery remained family-owned for four generations until 2002, when financial woes forced operations to cease, and the brewery all but closed. In 2005, fearing the brewery's unique artisanal lambics could be lost forever, friends Gert Christiaens & Roland De Bus took a chance and reopened the business and, with the help of Frank Boon, owner of the Boon Brewery (another lambic producer), relaunched the Oud Beersel line to great success. Today, Oud Beersel Brewery offers a number of award winning ales & lambics for distribution worldwide.